SERVPRO of Sylmar/ San Fernando is always looking out for our close community and surrounding areas so when disaster strikes we are ready to help. Boots on the ground and ready to help we have our crew doing what we can to help out. There were evacuations today due to the Creek Fire as its called and to give back to our community we are ready to pass out supplies and help out with our trucks at anytime! We are a 24/7 business but also a 24/7 family that cares about the people of our community! Be safe out there! We at SERVPRO of Sylmar/San Fernando take pride in our work. Whether it is a commercial or residential property we are well equip to handle any situation that may arrive. When there is too much stuff! When this last storm hit this family wasn't expecting to have the water damage they had. You don't realize how much stuff you actually have until you have to clean up something like water damage. When dealing with mold you might want to protect big items such as your furniture or things that are too big to move. We use this heavy duty plastic to protect our clients belongings from the testing and cleaning up process. This is a great example of what a cleaned up water damaged room looks like when its finished. When the floor and walls are removed the reconstruction crew comes in and makes it look like new. Lucky for this owner the room was empty but it still caused a lot of damage. But nothing too extreme because SERVPRO of Sylmar/ San Fernando was able to clean it right up! Can let the light into a business through the roof! After a heavy storm and a ton of water damage this commercial business suffered a loss in the roof. Lucky for them SERVPRO was there to tarp it up and clean out all the water. Mold can show up anywhere, inside and outside the house. In this case the mold came creeping out the house and showed up on the stucco. SERVPRO was there to clean it all up! Fires can really create a mess in the home. When the flames go out and the ashes show up no one wants to clean that up....but we do! Call us and let SERVPRO clean it all up! Water damage in your office is not the ideal place to have it. SERVPRO of Sylmar/San Fernando were there to dry it up and make it seem "Like it never even happened." Getting that water outta there! Sometimes there isn't a place to drain out the water so we have to think smart and do what it takes to get that water outta there! This is one of our brilliant ways of getting it out! The seals around the doors and windows are very important especially when a storm is on it's way. You must make sure you have no leaks because that may cause a lot of water damage. In this case the home owner was out of town when the storm came and he wasn't there to catch the water as it entered his home. Along with mold comes a very disgusting odor that can be pretty hard to get out. Lucky for our clients we have one of the newer air scrubbers that are out on the market. This equipment is used to eliminate the mold odor while our techs are cleaning it out. Ashes belong in a fireplace not the backyard of your home. When your home catches on fire and you are not there to call people to contain it, it spreads like the wind. Unfortunately for these folks they had a lot of personal belongings lost in this fire. When it comes to commercial buildings no job is too big and no job is too small. Just like residential jobs, commercial buildings can also have the same problems. SERVPRO of Sylmar/ San Fernando can handle it all. SERVPRO of Sylmar/ San Fernando staff is highly trained in not only doing the job right but doing it clean. Things like covering the doorway to contain the mess in this commercial building is only one of the ways we work clean. This is a great example of mold under a sink. Places like, under the sink, are very common for water damage which leads to mold because pipes leak, seals are not sealed correctly and messes happen. You must always make sure your roof is in good condition especially right before a big rain storm comes. This client had no idea that she had a leaky roof until after the storm had past and this showed up! When a pipe busted in the Coca Cola plant, SERVPRO of Sylmar/ San Fernando was ready to handle it. Our trained staff and amazing equipment were able to get into that massive warehouse and dry it right up. You don't get these nice green hills without a little help from mother natures rain storms. Although California can always use the rain for good, when it damages homes is where it goes bad. But have no worries, SERVPRO is always here to help. This house caught on fire on a Sunday afternoon while the owners were out to church. Unfortunately they were hoarders and with that comes along a lot of burnt items that needed to be disposed of. SERVPRO was there to clean up! Old mold is not an ideal thing to have in your home. The client didn't realize how out of hand it had gotten. SERVPRO of Sylmar/ San Fernando was there to clean it up and throw it out! This was the aftermath of a kitchen fire in San Fernando when we arrived on the scene. There was significant smoke and soot damage. The owner couldn't believe how quickly and completely we were able to clean the soot from the walls and ceiling. We make disasters "Like it never even happened." It's not fun when it rains and you have a leaky roof. This client had a small leak in her roof which caused major damage to her closet and part of her bedroom. SERVPRO of Sylmar/ San Fernando was there to the rescue! This store front has some seals that are old and leak when it rains and they felt the last storm we had here in Sylmar/San Fernando. The store had a ton of water damage that we gladly cleaned and dried up. Water Damage is one of SERVPRO of Sylmar/San Fernando's specialties. Our staff is highly trained and do a very clean job when it comes to cutting up drywall. As you can see in the picture the drywall will be easy to replace because we did a great job cutting it out. Dehumidifiers are used throughout the process to assist in the drying process. These Dehumidifiers are used to cycle the air in the surrounding area, run it through a cold evaporator coil. Inside of the evaporator coil, moisture is separated and captured in a collection tray; then warm, dry air gets pumped out of the dehumidifiers exhaust fan. 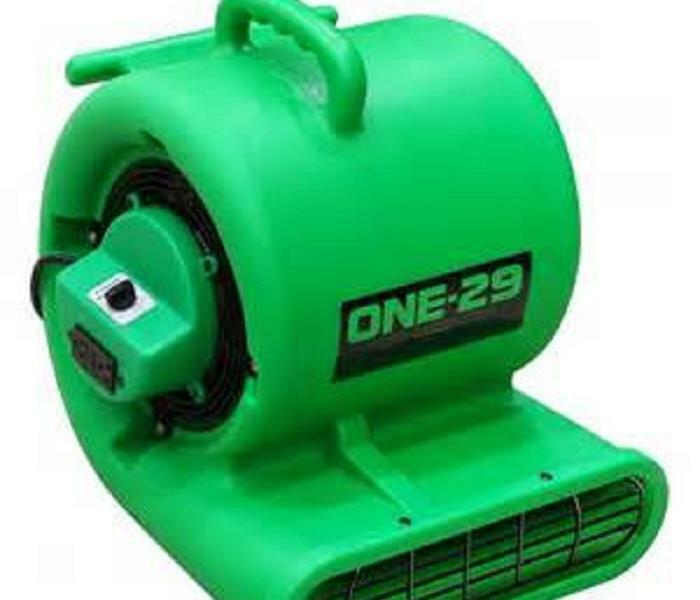 These air movers are mainly used in our water damage situations. 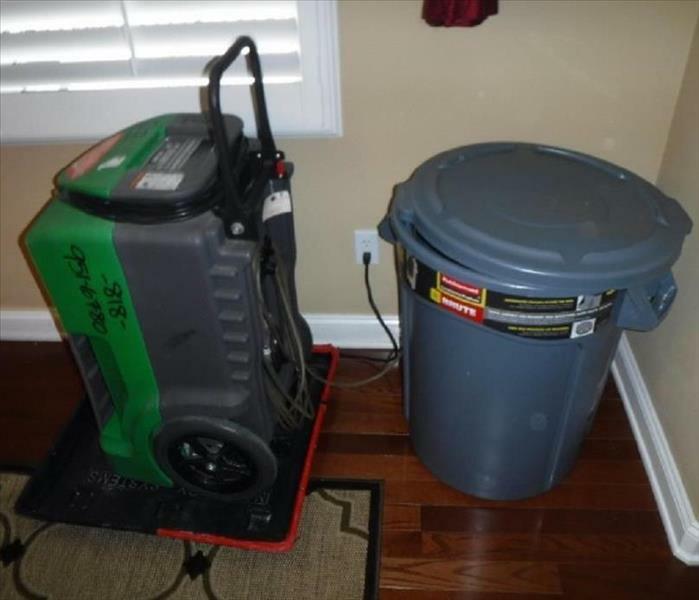 Air movers can dry out floors, carpeting, upholstery, and walls quite rapidly. If water damage occurs in a Sylmar/San Fernando residential or commercial site, SERVPRO brings in state-of-the-art equipment to help prevent any secondary damage. Industrial air movers are an essential tool in the restoration industry. There's nothing fun about experiencing a house fire. We understand that an obstacle like that can put your life on a complete stop, but there is nothing to worry about when you contact SERVPRO of Sylmar/San Fernando. Trust our company to know exactly what needs to be done to make it "Like it never even happened." Contact us to take that burden off your shoulders. Waiting for mold damage to occur can drastically increase overall job cost. Usually visible mold growth as seen above is a result of a long-term water damage that was not immediately taken care of. Once mold is spotted contact SERVPRO of Sylmar/San Fernando to keep the mold from growing. Storm flooding can cause serious problems for both home and business properties. Having a catastrophic event, it can take away from your business operations, and your own time. When a disaster strikes, remember to call SERVPRO of Sylmar/San Fernando when help is needed for your home and business. Our local home owner experienced a flood from the extreme storms that took place in California. They got in touch with us and we were able to extract all the water and save the property from further damages.